1 Pair Cutaneous Conductive Electrodes (Knees) 24"
The ReBuilder® is a fast and simple medical device powered by a 9-volt battery that incorporates a single output with a single knob to control intensity. The ReBuilder® sends tiny electrical signals to your nerves and muscles. These signals can wake up sleeping nerves and strengthen muscles. They travel from one foot, up the leg, across the lower back and then back down the opposite leg to the other foot. Then it reverses its direction and returns to the original foot. This action treats all the nerves of both legs and feet while stimulates the muscles of the calves to contract and relax to increase muscle tone and increase blood circulation. 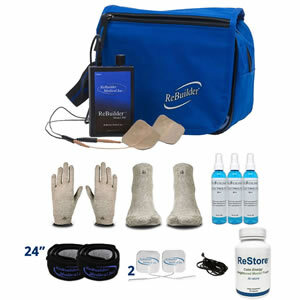 The ReBuilder® also stimulates the brain to release endorphins, which will relief the pain all over the body such arthritic pain and muscle soreness with no side effects. Pulse duration: 240 microseconds negative / 1.458 microseconds positive. Peak charge per pulse: 4 microCoulombs (µC). Pulse amplitude: 0 to 40 V continuously variable. Peak pulse current: 0 to 50 mA. Power source: 9 V alkaline battery (supplied). Weight: 8 oz. (with battery). Dimensions: 3" x 1.5" x 6.5". Fully registered with the FDA.